Last weekend, I attended the opening for a show of new work by Judy Onofrio, part of a two-woman exhibition Accumulation, New Work, Monica Rudquist and Judy Onofrio at St. Catherine University Gallery, Saint Paul, Minnesota on display through March 30, 2019. I became acquainted with Judy’s work through her jaw-dropping 1993 solo show entitled “Judyland” in the Minneapolis Institute of Art’s Minnesota Artist Exhibition Program galleries. Judy adapted the environment she had created in her home and backyard in Rochester, Minnesota, transforming the galleries into a sparkling, joyful place. The show was so popular, it was held over for several weeks. Her work was intriguing and I asked if I could visit to photograph her gardens - and our friendship began. By chance, the period captured in my photos 1995-2004 turned out to be a critical time in her career. Here are my photographs of Judy’s gardens accompanied by images of her sculptural work created during that period and the contemporaneous remarks of art curators, historians, writers and friends who have followed Judy’s work for years and write affectionately about it – and by Judy’s own words. 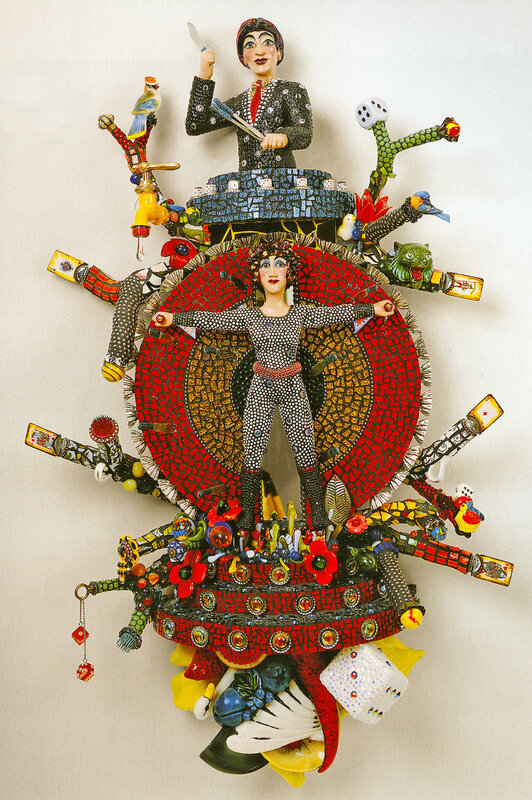 ”Judy Onofrio is an artist of uncommon spirit, one who seems to live on the edge of the primordial garden, the facsimile of which exists outside her studio window, spread across the hillside, overrun, luxuriant, home to frogs and snakes and raccoons, to arches and pillars and graves for family pets. She calls it Judyland. The gardener is her beloved husband, Burton. Their long and fruitful marriage surmounts modern statistics and hazards. Judy, the magician artist, twines the family, the gardens, and the home into a living work of art – and all the while, she toils away in her studio, with her own hands making something from seemingly nothing. A series of private outdoor rooms connected by meandering paths form the structure of Judyland. One enters through a “Welcome” archway, its columns adorned with bowling balls. As the garden spreads up the hillside, paths turn into steps cast of concrete and inlaid with tiles, ball point pens, marbles, horse shoes, and so on. Different artist friends have created works for specific sites. Certain motifs reappear throughout Judyland. Among them is a collection of bowling balls that float in the air on mounts fabricated from lamp bases and truck springs, or on upside down trees whose upward reaching roots cradle the balls. Onofrio’s cast concrete columns embedded with mosaic visually dominate the garden. Yard Art, 1998. 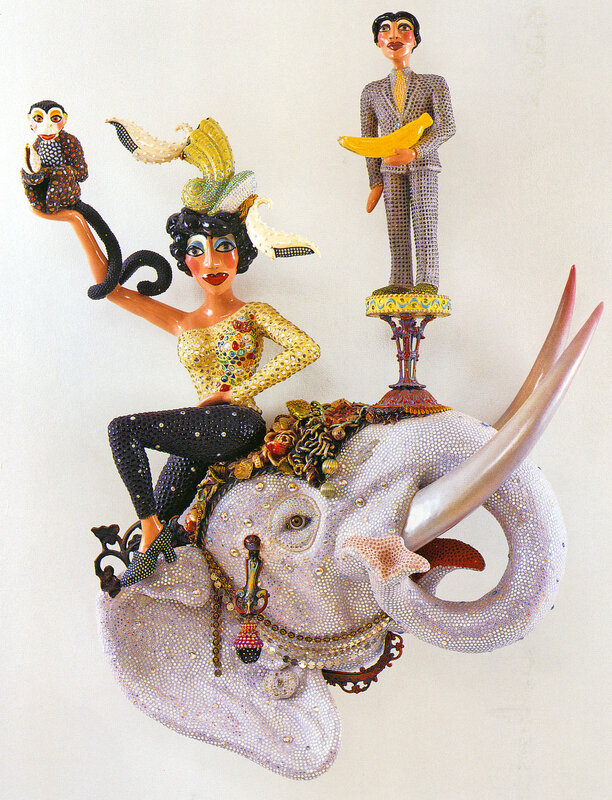 Judy Onofrio, 2005 McKnight Distinguished Artist, Minneapolis (monograph). 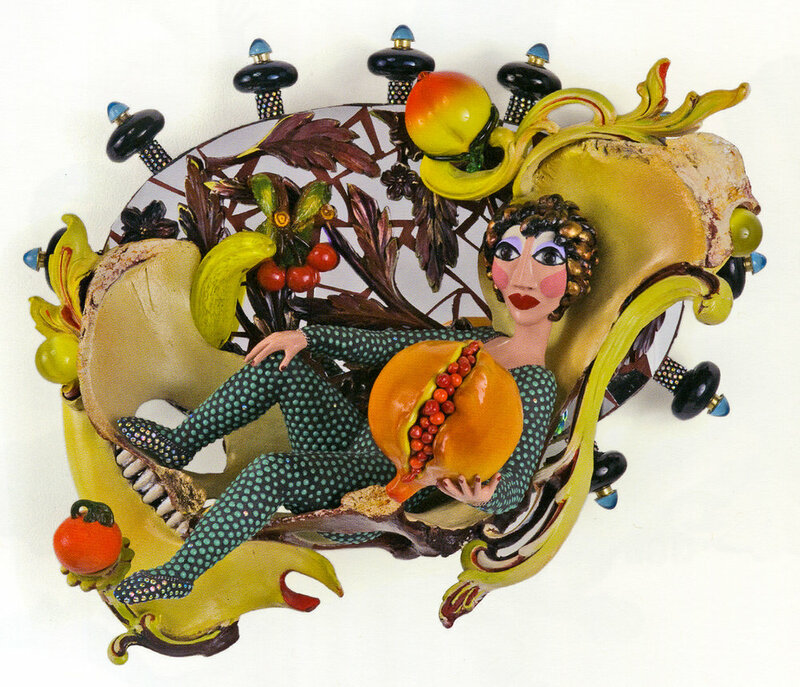 ”Onofrio identified with her great-aunt Trude who painted on trays and furniture and had a garden filled with wonders. Onofrio had always loved the visionaries who created large-scale, often madcap works from Simon Rodia’s Watts Towers in Los Angeles to Howard Finster’s Paradise Garden in Georgia to Gaudi’s Parque Guell in Barcelona with its magnificent undulating benches covered with china bits and pieces. She sought out Midwestern examples, such as the Grotto of the Blessed Virgin in Dickeyville, Wisconsin a fantastic display of assemblage. Over time, on the hillside behind the house on a quiet street that she shares with her husband, Burt (a retired neurosurgeon from the Mayo Clinic), Onofrio has created her own version, Judyland, a continuing work in progress. It combines grottoes, sculptural pieces and other delights featuring a dizzying range of materials from barn-roof ventilator covers to tractor seats, from horseshoes to glass telephone insulators. The decisive moment for Onofrio’s art came in 1989 when she found herself flat on her back after surgery. She started making brooches, collage pieces that included elements such as the charms she had been collecting as far back as junior high school. The brooches led to small shrines, where the brooches could be shown to advantage, and then things… got bigger. Before she knew it, Onofrio had fashioned a full-scale installation entitled Judyland, like the hillside garden, and first presented at the Minneapolis Institute of Arts in 1993. ”I am a self-taught artist. Throughout my life, my artistic interests have ranged from the formal to the naïve to the outrageous. In childhood, my role model was my great-aunt Trude, a lovable and eccentric outsider artist who worked beyond the confines of the mainstream art world. Aunt Trude followed a personal vision that drove her to make art until she died at the age of 90. It was her influence that launched my lifetime search for grottoes, visionary environments, and contemporary artists whose personal visions clearly stand apart. The joy I derive from making art complements my love for collecting an odd assortment of curios that provoke strong memories. I have a lifelong obsession with frequenting garage sales, flea markets, and auctions within a hundred-mile radius. This has led to a stockpile of materials for my work: buttons, glass jewels, beads, vintage jewelry, shells, glass fruits, mirrors, ceramic tiles, and many figurative objects. My process of working is additive. I start with a narrative often based on events that happen in my everyday life. I carve people, birds, fish, dogs, carrots, flowers – a whole world from basswood. Often, I use a vintage found object as a model, changing its proportion or meaning as I carve a version of it. These objects, with their rich trove of memory images, reference the passage of time and its effect on what we remember. Aside from the extravagance of color, surface ornamentation, and my ever-present sense of humor, each work tells a story of utopian wishes and dreams, a saga of seduction, duality and temptation. Anything You Want, 1998. Photo: Gus Gustafson. Madame Twisto, 2002. Photo: Gus Gustafson. Ring of Fire, 2000. Photo: Gus Gustafson. ”I first met Judy Onofrio over twenty years ago at the University of Northern Iowa where she had just given a talk and slide show. I knew immediately that this was a woman I wanted to know. From that initial meeting, we’ve gone on to create a personal friendship that has survived a myriad of life’s difficult and joyous situations, often simultaneously. What I felt initially has since proved true: Judy Onofrio is an artist and person of originality and integrity, generosity and commitment, grit and glamour. Bye, Bye, Birdie, 2003. Photo: Gus Gustafson. This work has a particular resonance for me; the sparkly brooch belonged to my mother, Hazel Flanagan. 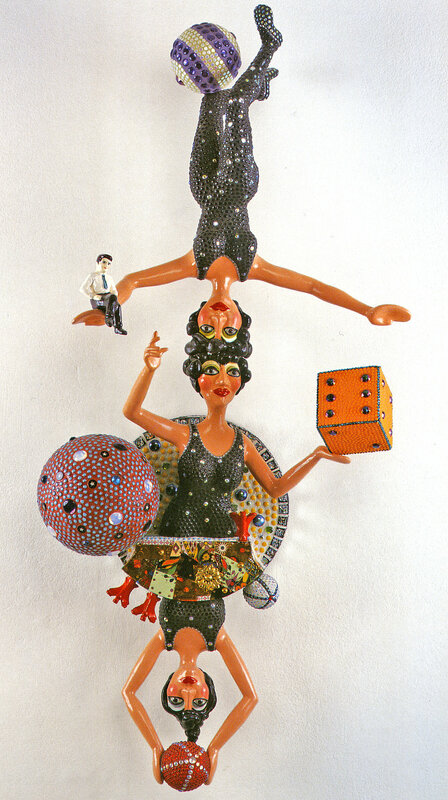 After she passed away, I shared her cache of costume jewelry with Judy and this piece found its way into a sculpture. All work above from the monograph Come One, Come All. Photos: Gus Gustafson. Fifteen years have passed since I visited to photograph Judyland on that spring day in 2004 when the sculptures stood in the bright sunlight against a field of blooming Mertensia virginiana (Virginia bluebells) carpeting the hillside. In 2008, Judy found a new direction. She began to collect bleached animal bones, assembling them into elaborate organic sculptural works. Many of the overall shapes and forms are familiar from the garden experiments and her previous work, but this monochromatic work has a gravity very different from the playful, colorful earlier pieces. No less complex and obsessive in execution, figuration and narrative have been left behind in works that are more subjective, and open to interpretation by the viewer. I find them somber, elegant and very moving. Judy presented this body of work in a major retrospective exhibition at the Rochester Art Center, Rochester, Minnesota in 2016 entitled “Unearth.” The show featured more than 80 works, presented on two floors and in four galleries. ”Since the 1980s, bones have occupied space in her studio and her psyche. As early as 2008, Onofrio began to integrate bone and teeth into her sculpture, focusing on it as a material. By 2009, Onofrio’s work contained bone and flowers – an interesting and complicated combination. Still symbolic, fruit and other objects found their way into the self-referential work. But the sculptures eventually became quietly monochromatic. That Peach is Pretty Nice, Too, 2008. A transitional work with all of Onofrio’s signature elements but introducing bones that hold their own in this tableau. “In the modern Western world, we have come to consider death as a boundary. In many other cultures it is not – it is conceived simply has a transition, and a dialogue between the living and dead forms a meaningful part of social discourse. The bones become a metaphor for memory. As an artist who has always balanced intellect and intuition, she knew that both as objects and metaphors, bones held a special power. In recognition of the bones’ primal power, she purged every element that detracted from that power. Colors became more muted and gradually fell away. Beads and found objects disappeared, too. Scale, ambition and Onofrio’s fierce attention to form and materiality remained… She allows the bones to speak for themselves, improvising relationships and building structures. Her bone sculptures in particular can be linked to Victorian mourning culture, with its emphasis on objects linked to the deceased. From the 1870s onward, it was thought that memories could migrate from the mind and attach themselves to objects. It was believed that objects hold memories, passing them from one person to another… Morbid associations are swept away as the viewer is caught up in the artist’s own curiosity. The current exhibition at St. Catherine’s University Gallery features a roomful of monochromatic, ivory-hued bleached-bone works that seem to glow from within. It is a beautiful installation with wall pieces, assemblages displayed on transparent Plexiglas cubes that make them appear to hover in mid-air, and a large, grounded vase-shaped work holding center stage. Illumination highlights the organic, sensual qualities of the bones and shadows play on the floor and walls. Judy Onofrio, 2005 McKnight Distinguished Artist, McKnight Foundation, Minneapolis (monograph). Judy Tells All; the artist’s own words and testimonials by peers and friends including Hattie Bremseth. Koplos, Janet. Resolved and Reassuring Forms in a Chaotic World. Essay accompanying current exhibition Accumulation, New Work by Monica Rudquist and Judy Onofrio, February 9 – March 30, 2019, St. Catherine University Gallery, Saint Paul, Minnesota. Leedy, Sherry. “Notes of a Co-Conspirator.” Judy Onofrio, 2005 McKnight Distinguished Artist, McKnight Foundation, Minneapolis (monograph) and Introduction in Judy Onofrio, Come One, Come All. Daum Museum of Contemporary Art, Sedalia, Missouri, 2005. Silberman, Robert. Minneapolis: Judy Onofrio at the MIA. Art in America, April 1994. Silberman, Robert. The Stuff of Art, Judy Onofrio. American Craft, June/July 1996. Vol. 56/ No.3, pp. 40-43, 64. Unearth | Judy Onofrio. The Rochester Art Center, Rochester, Minnesota. 2016. Catalog of solo exhibition with foreward and essay “Materiality, Texture and Form: A Lived Practice in the Work of Judy Onofrio” by Megan Johnston and essay “Unearthing Materiality and Meaning in the Work of Judy Onofrio” by Garth Johnson. During the late 1990s and early 2000s, I photographed gardens designed by artists, outdoor folk art environments around Wisconsin and Minnesota and odd random yard art displays that I collectively termed “vernacular visual expressions.” This story, written in 1998 about the magical gardens of Riana de Raad in western Wisconsin was never published, but it’s worth telling. I hope you find viewing these images of her gardens, made over the course of several summers almost twenty years ago and now a memory, a welcome antidote to the darkest days of winter. The blue and yellow polka-dot mail box along a country back road near Beldenville, Wisconsin, signals that you have reached Wouterina’s de Raad’s farm. As you turn into the driveway and approach the house, the life-size statue of Millie, a farmer’s wife fashioned of concrete covered with mosaic greets you. She looks out over the rolling hills and fields and carries a basket, bringing food to the farmhands. The basket is also a birdfeeder and Millie has an opening for a birdhouse where her heart should be. Wouterina, or Riana as she is known, made Millie, her first statue when she moved to the farm. She chose this home on a hill overlooking farm fields because she found this place peaceful and comforting. The gardens and statues she has created make this humble homestead a unique and magical place. The farmhouse is situated in a grove of trees that separate it from the barn and the open fields and the gardens are arranged in a series of “rooms” around it. Several other buildings edge the gardens including a studio workshop built of 300-year-old hand hewn timbers recycled from an early log home, a coop housing chickens with beautiful plumage, and a small guest house. Riana’s gardens feature an encyclopedic array of native and ornamental plants with unexpected juxtapositions of color, form and texture. Her sophisticated color sense combines plants like maroon hollyhocks, pink lavatera, ‘Purple Queen’ salvia, and Asiatic lilies in a clear bright orange and deep red in a single bed. Statues punctuate the beds, and other times, the beds are composed around the statues. Riana, a slight, wiry, vivacious woman has calloused hands that show acquaintance with the physical labor of building statues and planting and maintaining gardens. I spoke with her in the kitchen of the 100-year-old farmhouse as she cut up a large root of black cohosh to make a medicinal tincture. She came to Beldenville from halfway around the world. Raised in the Dutch East Indies and the Netherlands, Riana came to study fiber art with Walter Nottingham at the University of Wisconsin-River Falls. Her father ran a coffee and rubber plantation in the tropics and at age ten, Riana was sent back to the Netherlands for schooling. Her mother maintained a large garden in the tropics, and later in the Netherlands. Riana’s love of gardening began with the exotic plants of the East Indies and continued in the Netherlands where everyone gardens because the weather is so hospitable. 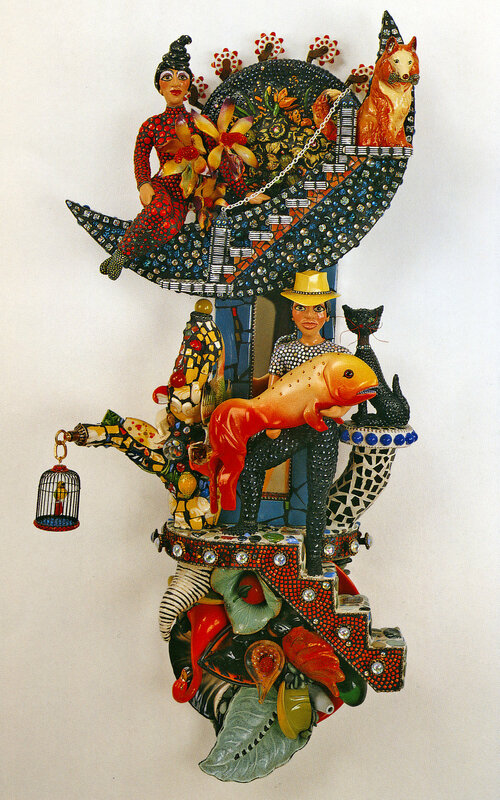 Riana’s early artworks were sculptural environments in boxes that bore a resemblance to folk art tableaus, often containing scenes relating to memories or made-up stories. She sees the gardens as just bigger environments. Near a bed of tall flowers beside the driveway are The Clothesline People. Stalwart Gary sports a red-white-and-blue outfit and bears up one end of a wash line in his outstretched arms. He is named after a real person: a large, strong local farmer who has the habit of working in bare feet. Opposite Gary are a female figure leaning backwards, struggling to hold up the other end of the wash line, a child assisting her. These poly-chromed figures embedded with mosaic, represent Riana and her granddaughter, Madeline. Marbles that look like luminous soap bubbles adorn Madeline’s dress and she sports a lid from a ceramic casserole dish for a hat. Recently, a concrete bird was added, perched above their heads on the t-shaped crossbar of the wash line. Madeline and Riana are arguing with the bird because it sits in the tree above and poops on the clothes. Many of Riana’s statues serve multiple functions, providing homes for birds and animals or seating for viewing the garden and the surrounding rural landscape. On the other side of the fence from the clothesline is the Alligator Bench. According to Riana, the alligator is creeping toward the nearby chicken coop for a meal. He is a very old creature and his back is covered with pebbles rather than the ceramic or glass on the other statues. The largest work is the Fish Bench that measures over 12-feet from snout to tail. Located in the back of the garden, it is framed by a grapevine archway and approached via a fieldstone path and provides a vantage point to survey the entire grounds. The elaborate mosaic on the bench is a self-portrait of Riana on vacation, lying on the beach looking at a magazine. An alternate reading of the subject could be the myth of Narcissus because the figure leaning on her elbow looking at the magazine appears to be gazing at a reflection of herself in a mirror. Her face beams with self-acceptance and satisfaction. Riana found my interpretation of the subject amusing but plausible. The tallest and most elaborate work, The Bowhunter, stands at the entrance to the main gardens. The statue depicts Riana’s friend Derrick who holds overhead the actual antlers of his first trophy deer from bow hunting. Lofty, his loyal dog of seventeen years, stands on his hind legs with his front paws on Derrick’s chest, tail wagging. Found street objects are embedded in Derrick’s shirt and his pants are covered with hundreds of buttons. Both statues feature pigmented concrete and applied color. Breton’s concept of convulsive beauty became one of the most enduring and significant art theories of the 20th century and inspires Riana’s garden. The Upper Midwest, particularly Wisconsin, has a rich tradition of sculptural environments by people with creative temperaments who saw potential in transforming cast-off objects and de-valued materials into unforeseen new objects. Riana’s work shares affinities with several of these vernacular artist’s environments which she has visited including Fred Smith’s Concrete Park in Phillips, Wisconsin. From 1948 to 1964, Smith constructed over 200 figurative sculptures in concrete decorated with colored bottle glass from his nearby Rock Garden Tavern. The tribe of stoical looking men and women arranged in tableaux that celebrate popular heroes and heroines of frontier life and lore are actually patterned after local farmers and townspeople. Over 200 figures, each of them individual. The Prairie Moon Sculpture Garden by Herman Rusch near Cochrane, Wisconsin, in the bluff region along the Mississippi River is another reference point. Created in the 1950’s by a retired farmer, its highlight is a 260-foot-long arched fence of steel wagon wheel rims covered in brightly pigmented and painted concrete. Over 40 sculptures including arches, spires, flower planters and other structures are encrusted with rocks, geodes, sea shells and pottery shards. Rusch was also skilled in modeling figures. Both the Fred Smith Concrete Park and the Prairie Moon Sculpture Garden have been restored and preserved by the Kohler Foundation of Sheboygan, Wisconsin. These environments are a unique part of our cultural heritage because they celebrate the creativity, and occasional eccentricity, of common folks. Riana often welcomes visitors in the evenings when she is not busy building statues or maintaining the gardens and often teaches mosaic classes in her studio or nearby at The Phipps Center for the Arts in Hudson, Wisconsin. Her current work may be viewed online here. One summer day in 1997, Riana held an open house and over 100 people from the Twin Cities and the area found their way down the back roads to her farm. As groups of people, some portrayed in her statues, strolled the gardens, it became a universe rich with associations. Riana circulated among the guests, making everyone feel at home. The garden had come alive with the narrative of her life’s story commemorated in statues, and in person, by her family and friends.